Anyone interested in audio electronics will encounter the works of Douglas Self sooner or later. His career as an electronics design engineer has spanned everything from serious mixing consoles to high‑end hi‑fi products, he's been a regular contributor to Wireless World magazine, and he has authored several books, including the Audio Power Amplifier Design Handbook, and Self on Audio. 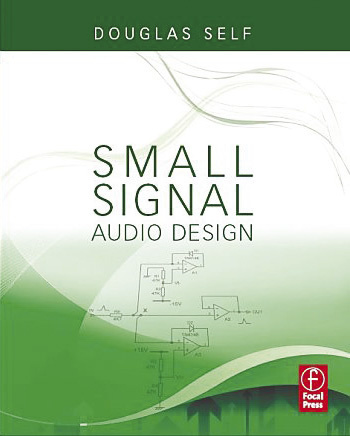 His latest book, Small Signal Audio Design (ISBN 978‑0‑240‑52177‑0), is concerned with the design of analogue circuitry related to microphone and line‑level signals. This weighty paperback's 556 pages are divided into 21 chapters, and are a treasure trove of fascinating design information. A good grasp of electronics will help the reader to appreciate the finer points of Self's comments and designs, but the book is written in such an approachable way that enthusiastic novices will be able to follow his trains of thought and gain a good understanding of the factors that influence audio circuit design. The book starts by considering different amplifier circuit topologies (voltage, transconductance, current and transimpedance), along with the aims and forms of negative feedback, optimal signal-levels and gain structures, and the different types and sources of electronic noise. With these basic concepts firmly under the belt, Self discusses more practical matters — such as how to attenuate, invert, amplify and balance audio signals quietly — and sometimes with surprising revelations. Chapter 2 investigates the properties of key electronic components, such as wire and PCB conductors, resistors, capacitors and inductors. Importantly, he investigates the factors affecting their sonic properties, including the distortion associated with different types of capacitors in different circuits, for example. The next couple of chapters cover the detailed design of discrete transistor and integrated amplifier circuits, the latter with notes on all the major op‑amp variants in common use, with their respective strengths and weaknesses. The remaining chapters provide detailed examinations of specific signal-processing sub‑systems. Starting with basic filters, Self then describes preamp architectures, vinyl disc preamplifiers, volume, pan and balance control systems, and tone controls and equalisers. We're barely halfway through the book at this stage, and he continues with chapters on full preamplifier designs, mixing-console architectures, mic preamps, line input and output stages, signal‑switching techniques, mixer sub-systems, metering designs, automatic level control (including compressors and gates), and noise generators. The book draws to a close with chapters on power‑supply design and interfacing with A‑D and D‑A converters. The emphasis throughout the signal‑processing sections is always on designing circuits that minimise noise, distortion and crosstalk, but with a constant eye on the practical cost of realising each design. Most examples employ op‑amps, often with comments about the effects of substituting alternative op‑amp types, backed up with measurements of real‑world circuit performance.